Dr Schäfer studied Protestant Theology in Tübingen, Münster and Paris and gained his PhD in the field of Old Testament Studies. He worked for several years as a post-doctoral assistant at the Biblical-Archaeological Institute at the University of Tübingen. He is a member of the United Bible Societies’ Europe-Middle East Area Translation Committee. Dr Voss studied Protestant Theology in Münster, Zürich and Tübingen and gained his PhD in the field of New Testament Studies. He worked as a post-doctoral assistant to the chair of Biblical Theology at the University of Saarland. 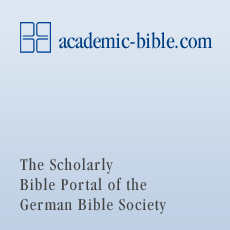 He has worked for the German Bible Society since 2003.